"Dog ulcers have multiple causes including medications, injuries, and several diseases. Ulcers are usually found in the gastrointestinal tract when the lining breaks down due to increased acid production. The problem can be caused by medications (NSAIDs such as aspirin, ibuprofen, carprofen etc), a cancerous growth, or a disease that is impacting the kidneys or liver. Other types include dog corneal ulcers which can interfere with eyesight and dog mouth ulcers. Treatment depends on the location of the ulcer. Treatment for gastrointestinal ulcers (GI) involve the use of acid blocking medications and dietary change. Corneal ulcers may require immediate surgical support to avoid vision loss." 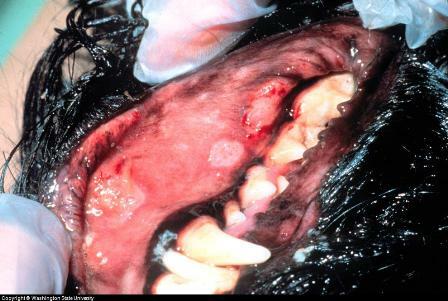 A dog ulcer is a sore on the skin or on mucous membranes. Most often when we talk about ulcers, we are referring to a small hole or erosion of the gastrointestinal lining. Gastric ulcers are caused by excess stomach acid. A gastroduodenal endoscopy is the best way to diagnose a dog ulcer. An endoscopy is when an instrument is passed into an area of the body. There is a small video camera the end to allow the veterinarian to view inside of your dog. An endoscope can also take a small skin sample. It can take some time and a lot of tests to diagnose your dog's problem. Your vet will start with the least invasive tests and move on to the more invasive ones when the first tests don't yield a diagnosis. Ulcers in dogs are not very common, so it will not be the first thing your vet suspects. Treatment of a dog stomach ulcer involves understanding and correcting the underlying cause combined with supportive care. If your dog is actively vomiting, oral intake will be restricted. He can be given fluids under the skin (subcutaneously) to prevent dehydration until the vomiting stops. Managing your dog's diet will focus on emptying the stomach to minimize the retention of contents within the stomach wall. When feeding is restored, the diet should assist the healing processes. Then a bland diet can be introduced a little at a time. Your vet may recommend a special diet for a dog ulcer. Medicine for Canine Ulcers include acid blocking medication. Medications that coat the stomach will probably be prescribed as well. Acid blocking agents include H2-receptor antagonists, proton pump inhibitors, gastric mucosal protectants (sucralfate), and synthetic prostaglandin analogues (misoprostol). If the canine gastrointestinal ulcer does not respond to medications, the veterinarian may recommend that a biopsy be taken to in the stomach and small bowel to determine if a neoplasm or cancerous growth is the problem. If the vet is able to identify a cause of the ulcer, for instance a certain illness, that condition can be treated. Otherwise, treatment will just have to be aimed at the ulcer itself. Response to treatment for canine ulcers caused by canine kidney failure, canine liver failure, or due to cancer tends to be poor. Canine corneal ulcers that are deep require immediate surgery to avoid vision loss. Healing time is related to depth of the ulcer and location on the cornea.